Whether it's The Epicure's Almanack from 1815, or John Metcalf's 1953 London A-Z, delving into an old guidebook gives you a taste of the city as it was then, allowing you to compare with the present day metropolis. Some parts of guidebooks tumble out of date quicker than others. Rick Steves' London 2006 is generally still applicable. OK, the cover is a Cliparty wince-fest, and yes, the California-born Steves does insist on calling The Eye 'The London Eye Ferris Wheel'. But by and large, you could just about use this book now, inoffensive as it is. 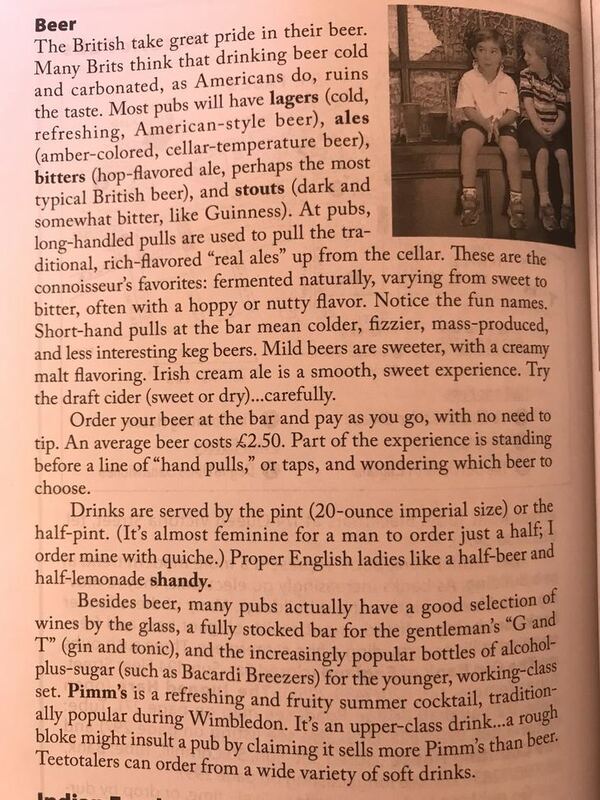 Inoffensive, that is, until you reach the chapter on beer. Let's pick apart the prose. "The British take great pride in their beer." Why thank you, Steves, we do. "Many Brits think that drinking beer cold and carbonated, as Americans do, ruins the taste." London was, in 2006, on the cusp of a craft beer revolution, with pioneers such as Meantime beginning to peddle the cold, carbonated craft elixir we now take for granted. But we can forgive Steves here, as by and large we were still resting on our tepid cask beer laurels. "An average beer costs £2.50"
Christ, did it? That makes us slightly sad. If we had a time machine, eff the dinosaurs — we'd travel back to 2006 London. "Drinks are served by the pint or half-pint..."
Yep. Back in those days if you'd asked for a third of anything, you'd be out on your ear. "It's almost feminine for a man to order a half..."
"...I order mine with quiche." Sorry, with quiche?! In which pubs are you getting these quiche chasers, Steves? "Proper English ladies like a half-beer and half-lemonade shandy." And of course, you'll all agree with that, right ladies? Know your place. Water down your Pride with R Whites. ["Pubs also stock] the increasingly popular bottles of alcohol-plus-sugar (such as Bacardi Breezers) for the younger, working-class set." "Pimm's is a refreshing and fruity summer cocktail.... It's an upper-class drink... a rough bloke might insult a pub by claiming it sells more Pimm's than beer." A sad sight we've seen unfold all-too many times in Pimm's-peddling boozers across the capital. Right, we need a drink. Mine's a warm ale and quiche. 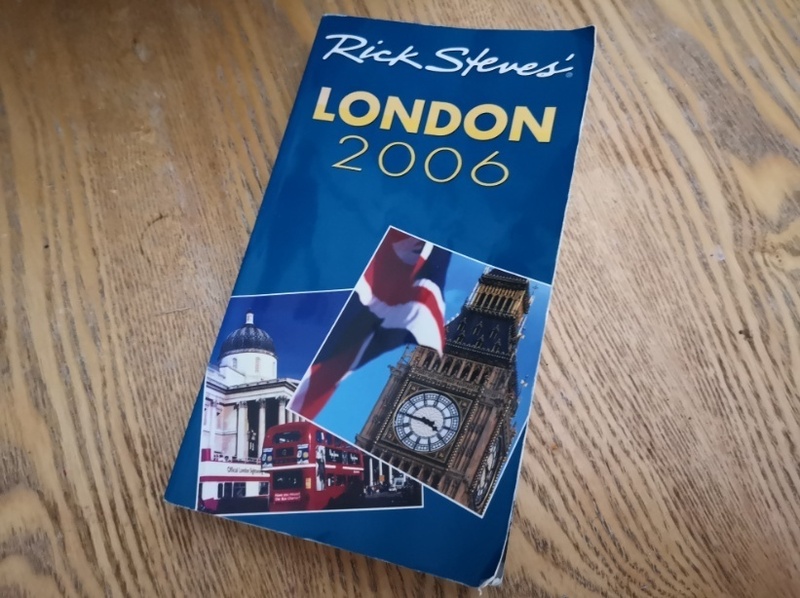 Rick Steves' London 2006 is quite possibly available in your local charity shop, priced 20p.